The contemporary Japanese artist Sawako Utsumi is once more focusing on the world of Dutch art. This time it is Hendrick Avercamp (1585-1634), unlike past art pieces that focused on Esaias van de Velde (1587-1630) and Aert van der Neer (1603-1677). Therefore, the delightful different color scheme and various different angles once more come to the fore in the latest art piece by Utsumi. Avercamp had to overcome adversity because it is widely believed he was deaf and a mute. This is based on documentation that stipulates his name being the Kampen Mute. Hence, one can only imagine how Avercamp overcame such obstacles and how society treated him. Irrespective of this, his early landscapes were extremely impressive. At the same time, Avercamp was inclined to include anecdotes that challenge the ideas of religious fervor in this period of history. For example, in the art piece titled “Winter Landscape with Skaters,” you have a couple making love and other interesting anecdotes. Over the last year, Utsumi is increasingly focused on oil paintings and this is clearly creating a greater level of creativity, passion, and generating a delightful angle to her art. Equally, the subject matter influenced heavily by Lee Jay Walker, is very unique. Hence, subject matters including Buddhism, Dutch art from the seventeenth century, the Kano School, Northern England, and Shintoism is extremely unique and based on the magical fusion of an amazing artist who continues to grow and develop – along with the creative ideas of her non-artistic mentor. 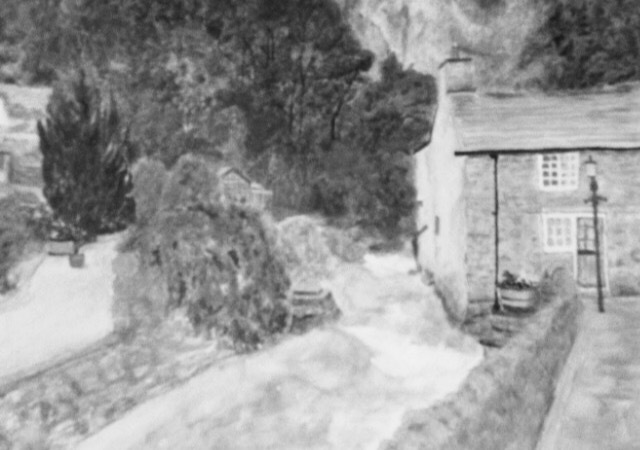 The contemporary Japanese artist, Sawako Utsumi, feels at home when viewing the stunning landscapes of the High Peak region in Derbyshire, England, and the dotted villages throughout the Peak District. Indeed, her latest art piece, titled High Peak Art of Castleton through Japanese Eyes, illuminates the different themes selected by Utsumi. 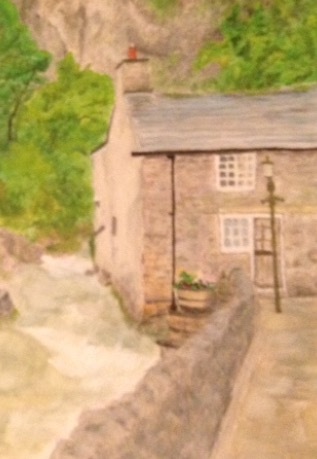 Therefore, rather than focusing on more natural themes of Castleton, her simplistic approach on one small area of the village still brings alive the natural beauty of the High Peak. In other words, Utsumi creates a stunning art piece that illuminates a stone house near a delightful stream. Of course, mountains surround the village of Castleton and this applies to the White Peak area in a southerly direction, and the Dark Peak to the north. This village being written down in the famous Domesday Book of 1086 witnesses the rich historical legacy of Castleton, known then as Pechesers. Not surprisingly, remnants of past history remain vivid based on Peverel’s Castle and the adorable St Edmund’s Norman Christian Church. Similarly, the importance of caverns serving the lead mining industry come alive in modern times based on a different tune. Therefore, tourists in modern times flock to Blue John Cavern, Peak Cavern, Speedwell Cavern, and Treak Cliff Cavern. However, despite the more rugged landscape, Peverel’s Castle, St Edmund’s Norman Christian Church, and other realities, Utsumi elegantly focuses on the most natural of settings. In other words, a beautiful house in the central part of the village is illuminated along with the flowing stream. Of equal significance, is the Cliff that rises above the house but the intricacy means that the view is gentle and minimal. Likewise, the trees contrast greatly with the main color scheme and this equally creates a natural and warm feeling. Other images in this article apply to a Christian Church in Bamford and the natural landscape of Grindleford. 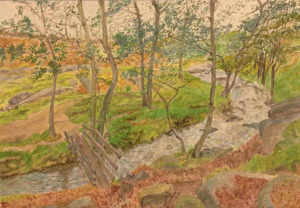 Overall, the latest art piece by Utusmi highlights the stunning reality of this contemporary Japanese artist, who fuses her love of past artists from Japan and Europe, to her own individual landscapes of the Peak District – and other themes in relation to Buddhism, Christianity, and Shintoism. 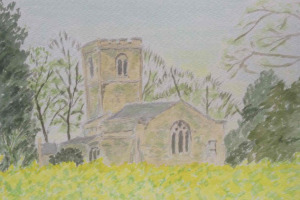 The recent oil painting by Sawako Utsumi, a Japanese contemporary artist, of a laburnum tree fits eloquently with her watercolor of a Christian Church in Brailsford, Derbyshire. This is based on the connection of the color yellow and the essence of delightful yellow flowers. 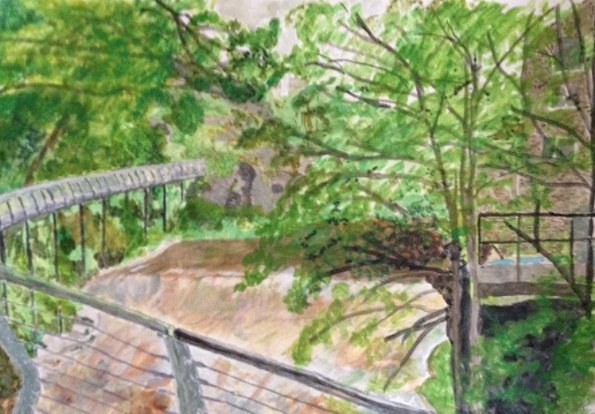 Therefore, the landscapes of England come alive in both stunning paintings by Utsumi. Interestingly, yellow in the Shinto faith denotes sacredness and one can’t escape the power of this color in both paintings. Given this reality, the art piece Brailsford Church in Splendid Nature is focused on the sacred but within the Christian faith. 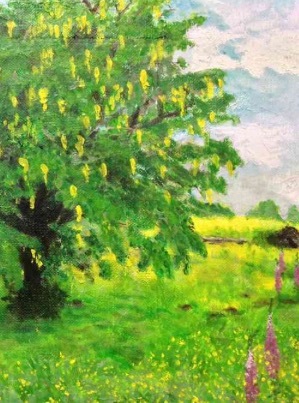 The other art piece, Laburnum Tree in Splendid Isolation, highlights the natural beauty of nature. 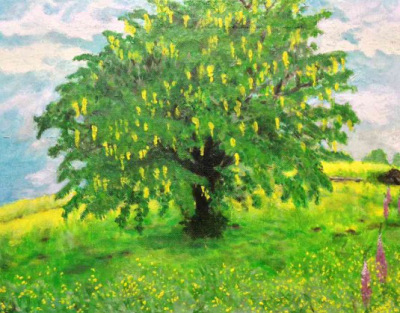 Indeed, for individuals who adore the laburnum tree, then while the original is located in northwest England, the tree itself could be in various parts of this nation. Immediately, the adorable laburnum tree in this art piece hits the individual because people who love this species will have vivid memories. Turning back to the delightful Brailsford Christian Church in stunning Derbyshire, then Utsumi fuses the sacred with nature. Naturally, from a Shinto point of view, then nature and the sacredness are part and parcel of this world. 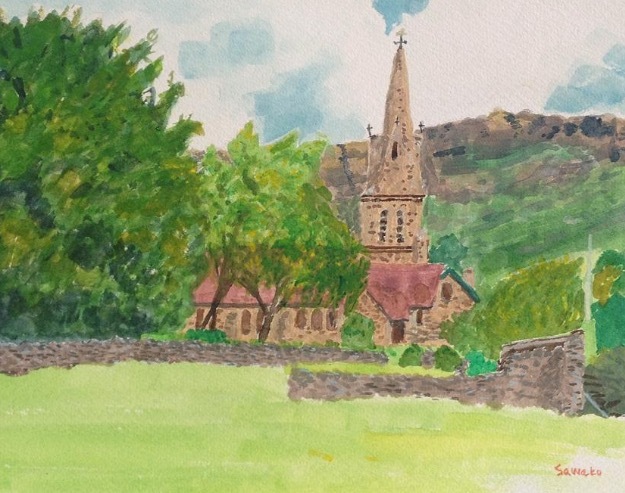 Therefore, for the artist Utsumi – despite the landscape and religious setting being extremely different in Japan – she equally feels at home when visiting and seeing delightful Christian churches in Derbyshire. Overall, the art of Utsumi fuses many themes and ideas that are often hidden to the viewer based on her own upbringing. Yet, even without this angle, the art itself works astonishingly well based on the landscapes and angle of nature in both art pieces. On top of this, the color yellow creates an eloquent and gentle reality irrespective of the meaning of sacredness in Shintoism. Derbyshire in England is blessed with countless adorable villages and towns throughout the High Peak region. Indeed, the entire county is a wonder for tourists who cherish nature, culture and history. On top of this, for individuals that seek to connect with the natural environment, to escape from the madding crowd and who seek to enjoy various outdoor pursuits, then this part of England is a real treasure. Also, the quaint Christian churches that dot the landscape are a reminder of the continuity of life and they provide a glimpse into the old England based on the central location of these holy places. Sawako Utsumi, a modern Japanese artist who hails from the Sendai region, simply adores the rich landscapes of the High Peak region. In this article, the focus is on beautiful Bamford, Edale, Grindleford and New Mills. 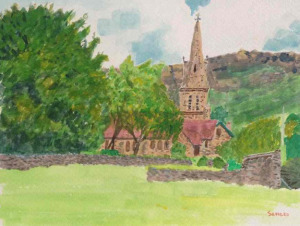 The art pieces by Sawako Utsumi in this article are titled the Bamford Church and Serenity of Nature, Edale Church and Beautiful Landscape, Natural Beauty of Grindleford and New Mills and the Reflection of Spring. These four delightful art pieces highlight the natural stunning beauty of the High Peak in stunning Derbyshire. 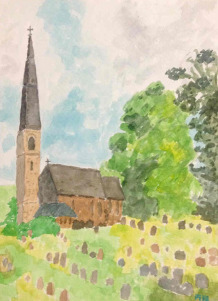 At the same time, two art pieces also highlight the central theme of Christian churches and how spirituality and nature combine naturally within the natural landscape, irrespective if individuals are religious or irreligious. 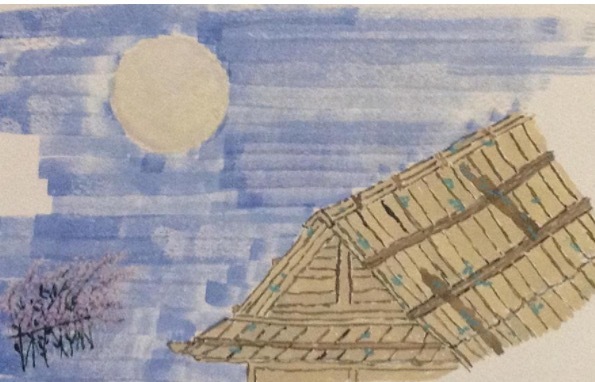 Sawako Utsumi may hail from the land of the rising sun but for this artist it is abundantly clear that the High Peak region is an amazing place to visit because of the amazing landscape. Not only this, for artists who adore highlighting stunning nature and elements of spirituality then beautiful Derbyshire provides ample places to visit. Indeed, despite Sawako Utsumi coming from a Buddhist and Shinto background the Christian churches reach within her artistic soul. This is based on the richness of architecture – and the open welcome of these Christian churches – that enable people to find peace and to contemplate about the bigger picture. Overall, it is clear that the rich reality of the High Peak appeals greatly and fuses naturally within the artistic, creative and spiritual soul of Sawako Utsumi. http://fineartamerica.com/profiles/sawako-utsumi.html – Sawako Utsumi and where you can buy her art, post cards, bags, and other products. Also, individuals can contact her for individual requests. The stunning landscape of the High Peak in Derbyshire is a real treasure and the same applies to the surrounding area. This applies to stunning nature, amazing villages within the mountain landscape, beautiful rivers, adorable Christian churches, tranquil canals and so much more. Therefore, Sawako Utsumi, like so many others before her, fell in love with the area. 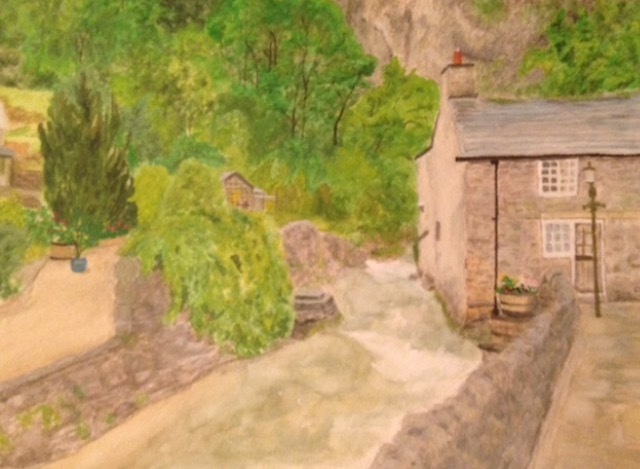 In this adorable art piece, titled New Mills in its Natural Beauty, the natural landscape is illuminated to an adorable level. Not only this, on the edge of the art piece, almost hidden, is a link to the industrial revolution. On top of this, the modern bridge is highlighted and this multi-dimensional approach blends so beautifully with the natural landscape of New Mills. Overall, Sawako is not only creating a stunning piece of art but the artist is also intent on providing hidden dimensions. This applies to highlighting how the natural landscape blends so beautifully together with the old world and modern world. Edale in the High Peak is a very beautiful place to visit in this part of Derbyshire. The small size community in the central location further adds to the power of the main Christian church that stands out dramatically. Therefore, one is spoiled for choice when selecting the backdrop because Edale is a real treasure. 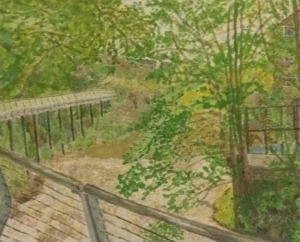 In the art piece by Sawako Utsumi it is clear that the central theme compliments the stunning landscape. Not only this, but the color scheme selected for the church and the power of nature becomes extremely apparent. Indeed, when viewing this adorable art piece then immediately it makes you wish that you could transport yourself to Edale, in order to feel the power of nature and spirituality. 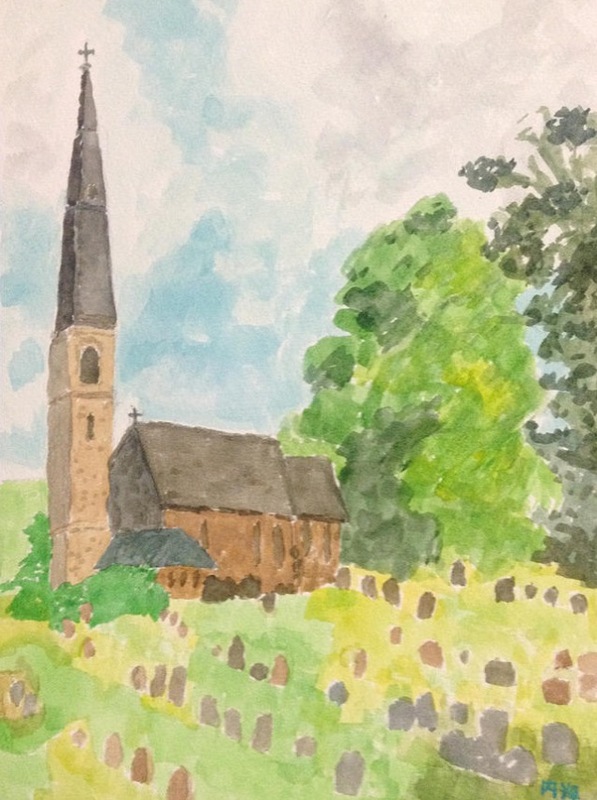 Once more, Sawako is highlighting the natural beauty of the High Peak, while also focusing on the richness of Christianity in this part of England. The mirage of Kamisaka Sekka can be felt in this art piece but with original themes based on the Japanese artist Sawako Utsumi. This applies to the altered nightfall and other areas in relation to the original by Sekka. Thankfully, the original idea and new imposed concept really befits the end result by Sawako. After all, the other side of night is always a great time to think about the past and future. Therefore, the new touch by Sawako really stands out. Overall, the delightful setting is a reminder of years gone by in old Japan based on the concept of tranquility and natural beauty.